From: Western Pennsylvania Humane Society, Pittsburgh, Pa. I never meant to adopt any sort of animal. My home has always been full of critters that have found their way to me; mostly exotic pets that have been surrendered by friends who got in over their head and knew I could handle it (parrots, turtles, Vietnamese walking sticks, etc.). I certainly didn't need another mouth to feed. 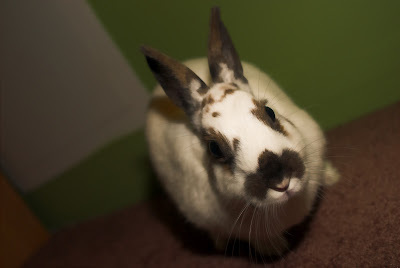 But when I went to the Western Pennsylvania Humane Society to say hi to the dogs and cats, I discovered bunnies. I met a volunteer in the bunny room who was lovingly feeding and chatting with each rabbit, and I immediately fell in love with the species as a whole. He introduced me to one lovely bun, who at the time was named Baby, and told me a bit about rabbit care and the basics of living with a house rabbit. Baby went home with me that day and was re-christened Ampersand Umlaut LaRue. We've been roommates now for three years, and I couldn't imagine my life without her. Rabbits end up in shelters by the hundreds every year simply because people don't realize that they require attention; more so than even some dogs and cats. 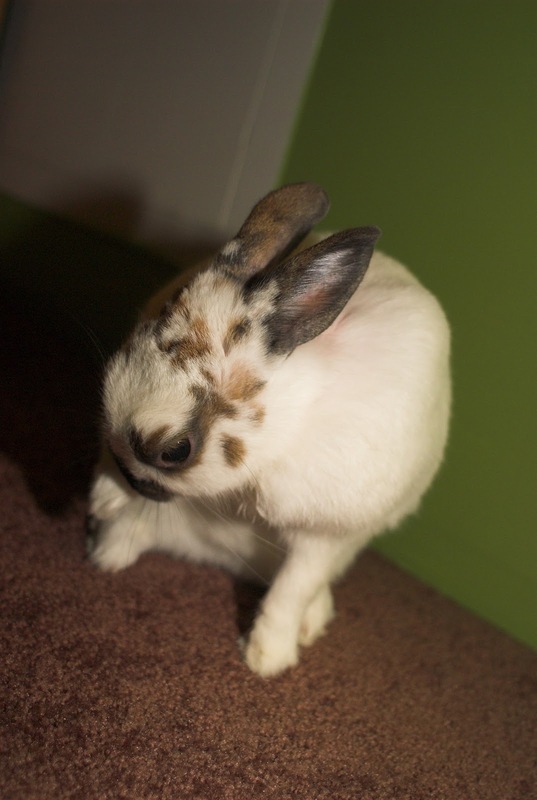 A neglected bunny is an unhappy bunny, and not much fun to have in your house, so people abandon them. The rewards of taking the time to socialize and train an urban house rabbit are limitless. Ampersand has made me a tidier person (no more leaving clothes or books lying around), a more responsible person (fresh food, water, and daily snuggle-time is a must), and an all-around calmer, happier person. 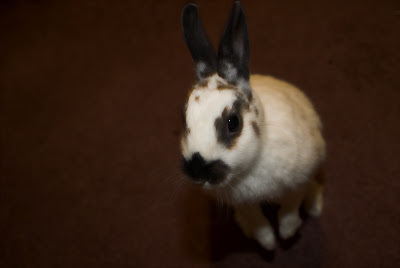 Not a day goes by that I don't talk to somebody about the benefits and joys of having a house rabbit. I can't even really call what we did litter-box "training," because she immediately knew what the litter-box was for. No training necessary. Bunnies are much cleaner and quieter than cats and dogs, and snuggling is an evolutionary survival tactic for small critters that live in holes in the ground! They simply MUST be snuggled! When people visit my apartment I tell them to watch where they step because Ampersand is known to dash towards you in an attempt to cuddle your feet. She immediately assumes that if it's alive, it's her friend. 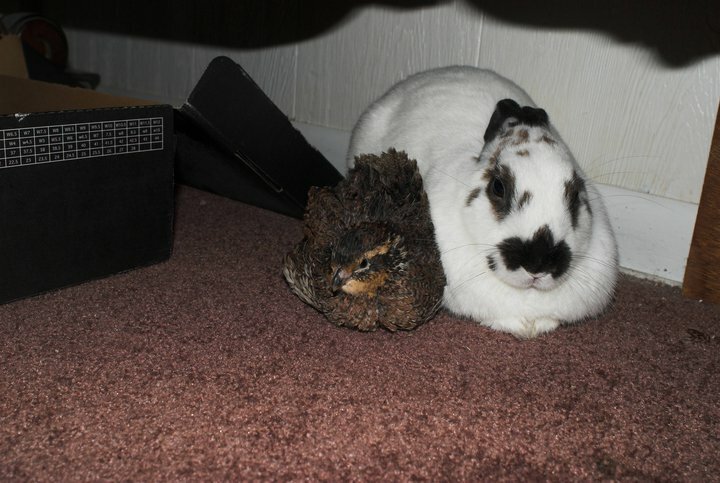 Even Meatball the quail is buds with Ampersand, which is generally not normal quail behavior. I recently began volunteering as a bunny buddy at the Western Pennsylvania Humane Society and I've made so many wonderful little furry friends. I can't express enough what a joy it is to have a rescue rabbit in your life! They're truly dedicated companions. Ampersand is always happy to see me, and she lights up my living room every day.